Poor indoor air quality represents one of the top five public health risks, according to the National Institute of Environmental Health Science. With the average person spending about 90 percent of his time indoors, taking steps to improve the air quality in your home can provide significant health benefits. Ionizers and other electronic cleaning devices offer an effective solution for removing pollutants from the air, but must be chosen with care to avoid potential problems and health risks. Ionizers contain an electrically charged wire, which sends charged molecules into the air in your home. These molecules, or ions, interact with pollutants and dust particles in the air due to an electric attraction. Depending on the type of system you choose, the ions either force pollutants to stick to walls or other surfaces within a room, or capture them on an electrically-charged collection plate near the ionizing unit. By removing these particles from the air you breathe, ionizers improve air quality and reduce the amount of particulates that enter your lungs. 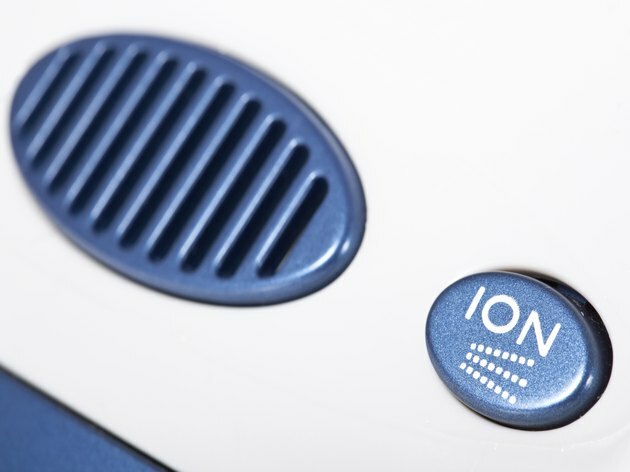 Both fanless and fan-based ionizers offer relief from some pollutants. Fan-based units rely on an integral fan to spread ions into the air. The fan tends to produce a high level of noise in most units, and these systems consume more energy than fanless models. Fanless models distribute ions more slowly, and thus take longer to clear the air. Without a fan, they produce less noise and consume less energy than models with a built-in fan. Consumers can choose from whole-house or room-based ionizers. A whole-house unit works with the home's central heating and cooling system, sending charged ions through the HVAC ducts. Room-based units sit on the floor in a single room, similar to a space heater. According to the North Coast Unified Air Quality Management District, central ionizers tend to operate more effectively than portable units, though room based models can be effective in some scenarios. According to the North Coast Unified Air Quality Management District, ionizers offer an effective solution for reducing asthma and allergy symptoms, but tend to be ineffective at removing gases and odors from the air. According to the U.S. Environmental Protection Agency, ionizers perform less effectively than HEPA filters or whole house electrostatic air cleaners in terms of removing dust, tobacco smoke, pollen and fungal spores from the air. Some ionizers generate ozone and pose a threat to your health, according to the EPA. Ozone produced by ionizers may contribute to breathing problems in healthy individuals, and may cause more severe health problems over time. Protect your health by choosing an ionizer that does not generate ozone, and works using pure ionization principles.